File Transfer Protocol as the name suggests is a standard way of transferring files between computers. You can use it to transfer files from your computer to your web hosting space. Krystal servers support SFTP (SSH FTP) and FTP/S (explicit SSL/TLS FTP). SFTP (SSH FTP or Secure SHell FTP) is available on port 722 and should be your connection method of choice with the default FTP account. FTP/S is explicit SSL/TLS FTP and can be access on port 21 - this should be used with any additional FTP accounts you create. Your accounts default FTP uses your cPanel username and password and gives access to your entire hosting directory structure, from /home downwards. You should use SFTP (SSH FTP) on port 722 to login using these details. Your cPanel username and password can be found in your welcome email, alternatively you can access cPanel for your hosting account via your Krystal Client Area. If you change your cPanel password, this will also change your FTP password for the default account. It's possible to add additional FTP accounts, this can be useful if you wish to allow someone else access to a sites files, but don't want them to access the rest of your home directory. These additional accounts can't use SFTP (SSH FTP), but instead provide additional security by using FTP/S (explicit SSL/TLS FTP). Login to cPanel and click 'FTP Accounts' within the 'File' section. Quota : Confirm the maximum amount of space you wish to grant to the above directory and all of its subdirectories - enter a number to restrict this user from uploading more than xMb, or select Unlimited. 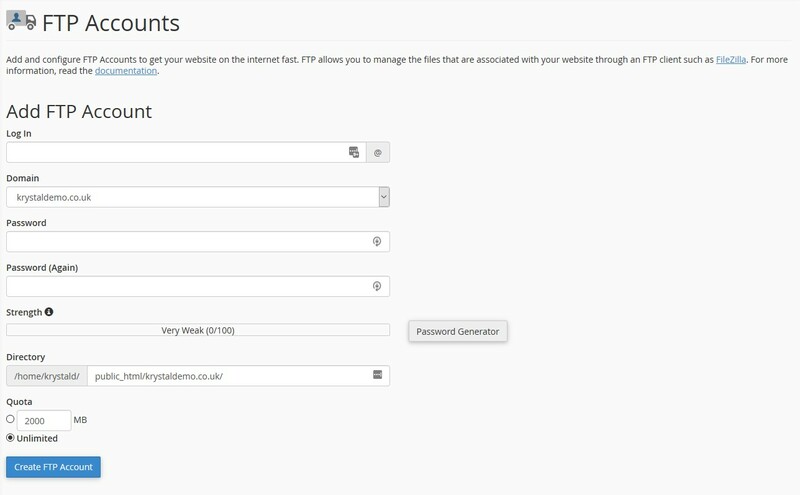 When complete, click the 'Create FTP Account' button to complete the process. *Passwords must be a minimum of 5 characters and meet a password strength of 65/100. You should use UPPER and lower case letters, numbers and special characters. Clicking 'Advanced Options' will allow you to define what characters are included in the password. To accept the password generated, make sure you have noted it down, then tick the 'I have copied this password in a safe place.' 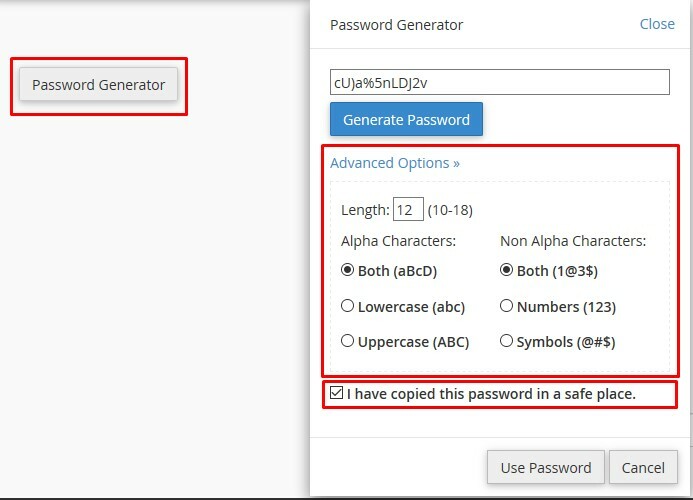 checkbox, and finally click 'Use Password' to populate the two password fields. You can always safely delete an extra FTP account - this will NOT remove the files that have been uploaded. You can change the password or quota of an additional FTP account by clicking the 'Change Password' or 'Change Quota' links in the FTP Accounts section of the FTP Accounts page.